I take selfies about as often as Kim Kardashian wears chunky cable-knit turteneck sweaters. Which is to say, almost never. I can never get the angle exactly right. Each photo seems to accentuate my nostrils. Where was I going with this? Oh, right. 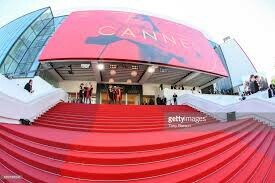 The one regular exception to my rule is the red carpet steps outside the breathtaking Palais des Festivals theater at the Cannes Film Festival in the South of France. Even in broad daylight surrounded by fannie pack-wearing tourists, this is one magical red carpet ride. Start at the bottom and try not be overwhelmed by the color that can only be described as Santa Claus-meets-ER blood. Ascend step by step and realize that Ingrid Berman, Sophia Loren and Julia Roberts all made this exact same journey. Once you finally reach the top, you can look out and see the French Riviera, the designer shops and the Regular Folks at a distance. Only Rocky Balboa feels more accomplished. During a premiere, the tuxedoed paparazzi are relegated to the sidelines, for they not dare put their unpolished shoes on this fabric. Awash in all this international glamour, the only natural reaction is to get out a camera and snap this moment for posterity. Step right up to the Palais! If you can . . . 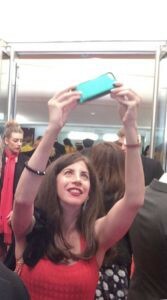 Tragically, the Cannes red carpet selfie has now gone the way of the pastel Le Clic Disc camera. Last week, organizers announced that taking a self-portrait is forbidden. Festival director Thierry Fremaux told Le Film Francais magazine that Selfies “go against what has made Cannes’ reputation. A certain elegance, discretion.” Fair enough. Cannes is nothing if not elegant — after all, this is the same festival, the same red carpet that recently banned flats. But I still wish that Fremaux would reconsider. Nobody is taking photos in front of mirror with a sucked-in stomach here. I’m talking about capturing a second of joy. Three seconds, max. Tragically, the sequel: I’m not going to Cannes this year. Even if I were, I wouldn’t dare breach protocol. These French security guards mean serious business. A few years ago at the premiere of Carol, I tried to sneak down the balcony steps and sit with the prestigious white-colored badge press holders. (That’s a whole different conversation.) A guard pulled me aside, wagged his finger and sternly told me in broken English, “Non, madame.” I convinced him to let me do it after the lights went down. Then I proceeded to trip over my wedge heels and fall on my face right around the time Cate Blanchett first flirted with Rooney Mara. So I know better. 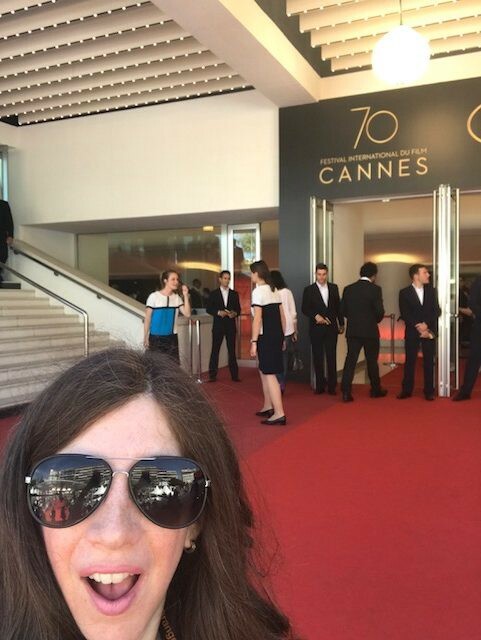 In the meantime, I have the photos to prove that a gawky Midwesterner once, twice, three times made it all the way to Cannes. Snap! I went to the premiere of the BFG. This red carpet was more memorable.